Apply permissions to specific users instead of just usergroups. Description: Apply permissions to specific users instead of just usergroups. Database changes: 1 new table, 1 new column to 1 default table. 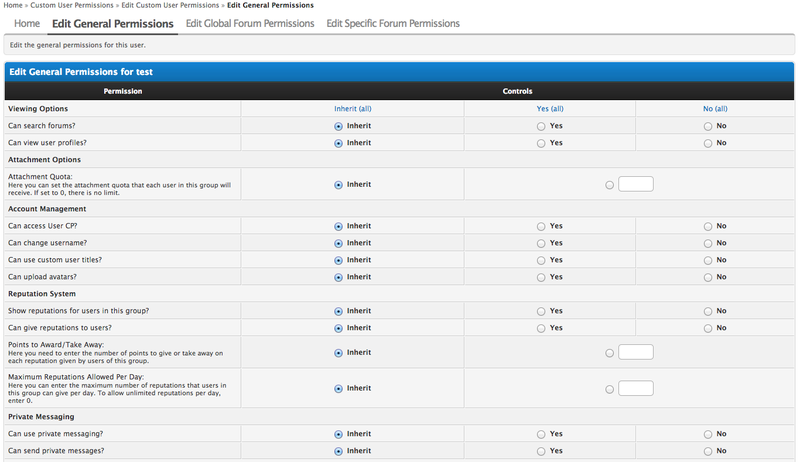 Go to ACP > Users & Groups > Custom User Permissions. This plugin will allow you to give permissions to specific users. 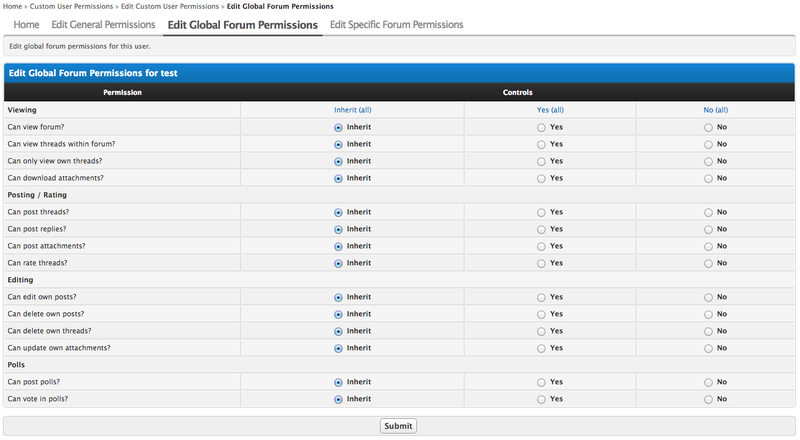 You can set custom general board permissions, and also set permissions for specific forums as well as globally, which will override any other forum permissions. 17/11/10 - v0.1 -> Initial beta release. 25/08/14 - v0.2.2 -> v1.0 -> MyBB 1.8 compatible. Added autocomplete for username field. To upgrade, reupload ./inc/plugins/customuserperms.php and ./admin/modules/user/customuserperms.php. 24/01/17 - v1.0.0 -> v1.0.1 -> Fixed a bug with text not appearing when using PHP 7. To upgrade, reupload ./inc/plugins/customuserperms.php and ./admin/modules/user/customuserperms.php.